In a previous post I discussed the importance of writing down your dreams … But what if you’re sitting down with your journal, ready to receive the wisdom of your dreams, and they don’t show up? In short, you’ve decided to listen to your dreams, but they’re not talking. When people tell me they don’t remember their dreams, I ask what they think about dreams in general. Usually they say they think dreams are meaningless, or just plain bizarre and not worthy of their attention. Maybe they had a soul-shaking nightmare, and they don’t want any more of those. As a result, they close their eyes and ignore everything that happens from when their head hits the pillow to when the alarm wakes them in the morning. In short, they’re not listening to their dreams. And now, the dreams aren’t talking. Face it: Most of us don’t treat our dreams with the respect and consideration we show to a stranger on the bus—let alone a close friend. Too often we wake up, bolt out of bed, and let our dreams wash down the drain with the shower water. And then we wonder why we no longer remember any of them. A good way to remedy this situation is to think of dreams like a dinner companion; they don’t enjoy a one-sided conversation. Who does? And if you stop listening to this person, after a period of time, they will simply stop talking. (Or in this case, the dreams dry up). That’s when you decide to put the pillow over your ear and ignore those dreams. Now, if this conversational pattern were happening between a husband and wife over time, we’d suggest couples counseling, wouldn’t we? And the first thing the counselor would likely do is to help these two learn to listen to each other. When you wake up, spend a moment in stillness and silence before you get out of bed in order to allow any dream memories to come to you. If you remember a dream or dream snippet, write it down, sketch it, or tell it to a friend. If you pay even this much attention to your dreams, before you know it you’ll begin to recall more of them, and the dreams you have will gain clarity and resonance with the issues you are dealing with in your daily life. It might just be the start of a beautiful relationship—with yourself! But isn’t all that dreaming exhausting? We’ll soon find out. When I mention how many dreams I remember each morning (3-5 is not unusual and my dream reports can run up to 2,000 words) people often ask me if all that dreaming makes me tired. I quickly answer that no, my high level of dream recall doesn’t interfere with getting a good night’s sleep. To back up my claim, I’ve polled other prolific dreamers and they say they’re energized, not exhausted, by their abundant dream harvest. But the fact is, I’m chronically tired. I’ve always assumed this is a result of the hectic pace of my waking life and not the seeming hyperactivity of my dreaming brain.For better or worse, I will now have the chance to find out once and for all whether all this dreaming is wearing me out. Later this month I’ll be going in for a sleep study to see if I have any sleep-related disorders that are causing my fatigue—and perhaps also contributing to my unusual level of dream recall. Here’s what happened: Like many women my age, I’ve become more forgetful than I was a few years back. My friends reassure me that having a tough time remembering the names of actors or where I put my keys simply comes with the territory of getting older. But my mother has Alzheimer’s disease, which has made me hyper-vigilant about my own memory, and I wanted a professional’s opinion. So, I made an appointment with a neurologist, and after a seemingly endless battery of tests the results were in. My brain functioning was deemed normal, with no signs of early Alzheimer’s or dementia. This news allowed me to breathe a sigh of relief—but I still wasn’t satisfied that the difficulties I’ve been having with memory are purely a result of getting older. When I mentioned my vivid, and abundant dreams, along with the fact that I’m told that I talk in my sleep and snore lightly, the doctor raised the idea of a sleep study to rule out a mild case of sleep apnea or narcolepsy. “A sleep study!” My eyes lit up as if I’d been told the answer to my woes was a trip to the Bahamas and my health insurance would cover the cost. I realize that for most people having sensors stuck to their head, face, and legs, and then going to sleep in a strange setting is not particularly appealing. But for a dream therapist like myself, this sounds like an exciting adventure. After all, anything that helps me understand sleep and dreams better, not to mention how my sleeping brain works, is my idea of a good time. I thought about this for a moment. It sounded like that O’Henry story where the woman sells her hair to buy her lover a watch fob for Christmas, and he sells his watch to buy her beautiful combs for her hair. What if the best thing about sleeping gets taken away from me so I can get a better night’s rest? “I’ll manage,” I told the doctor. For one thing, I can’t be greedy; I’ve already had more than enough dreams for a lifetime. And besides, I could always fine-tune the art of Shamanic journeying in order to enter dream space in another way. 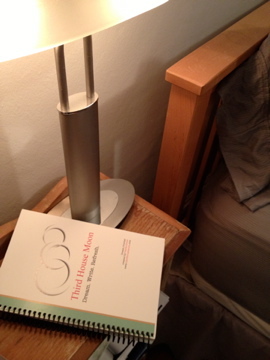 In the meantime, I’m looking forward to finding out what sleep science can tell me about my dreaming brain. Q: I know it’s important to write down one’s dreams, but I have so many each night that writing them all down feels like a part-time job. Help! Back when I was in my late 20s I worked as a reporter for a regional newspaper. One day our company sponsored a health fair during which representatives from a local hospital took over a couple of the administrative offices. Each of us in turn was called inside where we were pinched with pincers to measure our body fat, had our blood pressure taken, height and weight checked, and were asked a series of questions about our diet and lifestyle. In return we received a report containing recommendations for improving our health. All this in the name of preventative medicine—and, I’m sure, keeping down our group’s insurance rates. In any case, after being poked and prodded each of us returned to our desk with a dot-matrix printout containing our health profile. One at a time reporters returned to their desks grumbling about being told they had to cut out their morning doughnuts, or cigarettes, and take up walking or table tennis to help them shed a few pounds. When I returned to my desk, I adopted the same exasperated tone as my weary co-workers and announced that according to my health profile my cholesterol levels and weight were too low and I needed to add more butter and eggs to my diet. Let’s just say I was not the most popular employee on that particular day. Fear not, My Dear, you have come to the right place. I shall pull myself up to my full Size 4 Stature and stand up for you. Yes, this embarrassment of dream riches is indeed a problem that must be contended with. Invoke the 5-Minute Rule: When it’s time to record your dreams, set a timer for five minutes and write what you can before the chime sounds. Imposing time pressure will force you to choose the dreams or images that are most interesting or meaningful to you. Focus on those. Headlining: Consider each dream and give it a headline. List those, and leave the dream details for another time. Night notes: Rather than record your dreams first thing in the morning, wait till bedtime. Time acts as an effective filter, and by nightfall you’ll only remember the most salient dream scenarios and the most important details. In dreams we trust: Sometimes we worry that if we record dreams selectively—we’ll select the wrong ones and miss out on some gem of dream wisdom. Trust that your dreams are gentler and more forgiving than that. If there’s anything important that you’ve missed, it’ll come back around in another dream, another night. Now that I’ve helped you manage your dreamtime, I hope you’ll dream up some fabulous new activity to keep you busy during those extra hours in the morning. Table tennis anyone? Want to learn more about your dreams? Contact me to find out about upcoming dream groups in western Massachusetts, or individual dream sessions by phone, Skype, or in person. Q: I have a hard time remembering my dreams (I usually remember the nightmares). What can I do to help myself remember my dreams? I might remember part, but it gets foggy within seconds after waking. I am a woman of a certain age—No, I’m not being coy, I’d tell you my age, it’s just that I can’t remember it. But seriously. I am at a time of life when I forget a lot of things in my waking life: Where did I put my keys? My glasses? Oh, is that them on top of my head? The dreams however—those I remember. So, that’s a little pep talk for you, dear Forgetful One: If I can remember dreams, you can too. It’s also my way of opening this conversation up a bit. In waking life we accept that we remember some things and forget others. But when it comes to dreams, we more or less expect to forget. Scientists tell us that low dream recall is the norm because the brain chemicals that support short-term memory recall are tamped down when we’re dreaming. But there must be more to it than that. After all, in cultures that value dreams, people remember dreams on a regular basis—the way we some of us remember the batting averages of every Red Sox player that ever lived, or lines from favorite movies or songs we haven’t danced to since the days of three-piece white suits and disco balls. My point is this: In our cultures where dreams are considered bizarre or random occurrences void of meaning, guess what—the general population tends not to remember them. As for you, my dear Forgetful One, you do remember some dreams. You remember the scary ones. No surprise! When dreams really want to get our attention, they deliver something we’re not likely to forget: Breathless chases, sharp-fanged dogs, and terrifying falls from high mountain passes—no wonder some people don’t want to remember their dreams. So, kudos to you for wanting to recall more of them, despite the fact that the opening sallies have been a bit disturbing. So, how to remember more dreams? That is indeed the question. For starters, do exactly what you are doing. Taking a genuine interest in your dreams is an important first step. And that means taking an interest in all of your dreams, not just the ones that include blissful flights over emerald green tree tops. One way to show your dreams that you are paying attention is this: Put a pen and pad by your bed (or your smart phone with the record function ready to go) and record your intention to recall your dreams before bed. Write it down: “Tonight I will dream and remember my dreams in the morning.” Then write down something in your notebook when you wake. Do this for a week or more, and that should get the dreams flowing. But here’s the thing … you need to welcome all comers. If you get anxious dreams, scary dreams, or seemingly random and bizarre dreams, snippets, sounds … whatever, write them down. Dreams sometimes behave like teenagers, you see. They test you with their moods, and ugly outbursts—but if you stick with them and let them know you’re listening and honoring all of who they are, they’ll start to share the wise, warm, and loveable souls that dwell deep inside as well. And anyone who’s raised or taught a teen, knows that it’s well worth getting past the nightmare moments to get to the dreamy depths of who they really are. As for that morning fog, yes, for most people if we don’t grab those dream memories before our feet hit the floor they’re lost forever. 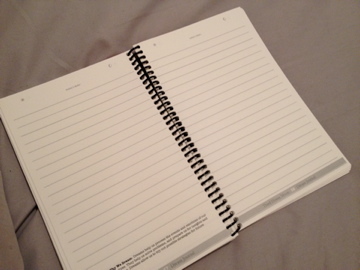 So, remember that notebook you’ve placed by the side of your bed? Grab it before you roll over and kiss your sweetie good morning, before you check the time, or get up to pee. Write down whatever you’ve got, and then get going. I hope this helps clear a little of that dreamy fog away, so you can step onto the Royal Road to your unconscious. & do keep me posted. In the meantime, may you be well and dream well. Visit me at Third House Moon for more information about dreams and dreaming. 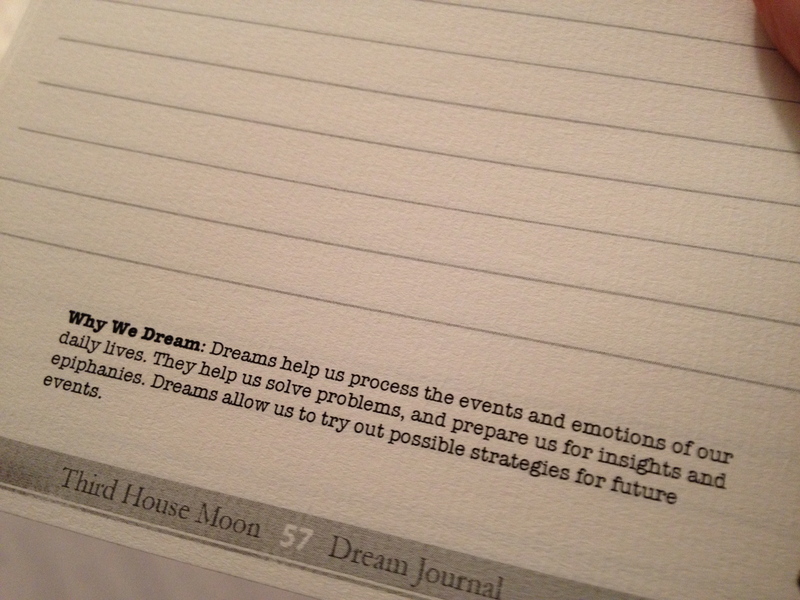 No, a dream journal is not just for recording what happens at night. What we dream asleep—and what we experience during the day—are intimately connected. 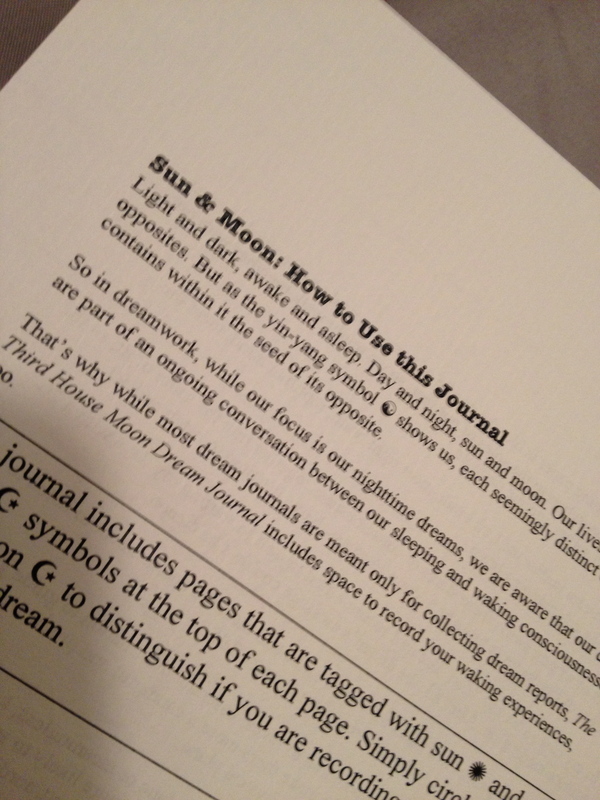 That’s why the Third House Moon Dream Journal is really a journal for morning, noon, and night. 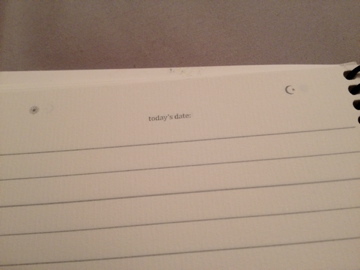 This journal has pages marked with Suns and Moons, so you can track daytime activities (just circle the sun at the top of the page when writing about your day) and your nighttime dreams (circle the moon at the top of the page when writing down your dreams). The journal also includes facts about dreaming, tips for recalling, recording, and understanding dreams, an index for logging recurring dream symbols, dream themes, and experiences with extraordinary dreams (lucid, precognitive, etc.) as well. You may just find that when you begin to pay attention to your dreams and how they interact with your waking life, the whole experience becomes that much sweeter … morning, noon, and night! 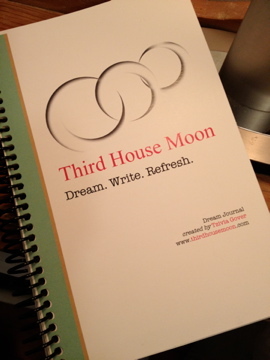 To order the Third House Moon Dream Journal ($10) send me a message with your request and your postal address. I’ll respond with information on where to send your check, and the total amount including shipping.